Holiday Fun and Learning for Babies and Toddlers! So it's your baby's first Christmas, or second, and you are looking for a Puzzle for him/her. There are lots of great choices in this segment: puzzles are a fun activity for babies and toddlers that help them develop their coordination. At first they may put the pieces in their mouths, but hey - that's what these toys were designed for. Let's take a look at some of the Best First Puzzles for Babies and Toddlers. These puzzles will educate and entertain your kid starting age 1, going up through 2, 3 and 4 years old. I've found you puzzles for toddler boys and girls. They'll help develop motor skills which will be useful all through their lives. Made from eco-friendly materials, these two piece puzzles are easy to assemble. The pack contains 6 puzzles, and the pieces are large enough for the babies to grasp and build. Nice Christmas gift for the kids. Helps infants and Babies become familiar with three aquatic beings - Fish, Turtle, and Crab. Nice colorful pieces with large knobs. Puzzles are a great way for the kids to develop their creative skills, motor skills and learn team play. Floor Puzzles are the sort of toys that provide an element of freedom, which is tough for the regular jigsaw puzzles to achieve. 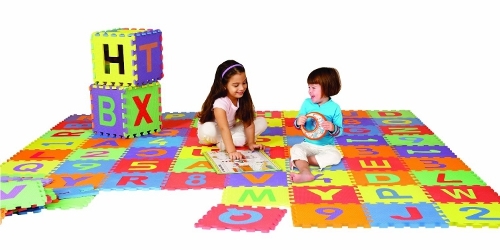 If you would like your toddler to have clean Christmas Edutainment - gifting him/her a Floor Puzzle is a nice choice. This three feet high floor puzzle features twenty five pieces and will be loved by the young ones who like the Sesame Street series. Great gift idea for Christmas. Thomas the Tank Engine is a celebrity no doubt. Kids love him in all his Avatars. This 24 piece floor puzzle is a cool Christmas gift for all kids who like this cute and powerful character. This is a Floor Puzzle and a Mat rolled into one. Provides a nice playing surface, as well as a cool learning experience for the young ones. You can wash the individual squares, certainly a colorful and durable buy. Geography was one of my brothers favorite subjects in school. He can still spend hours checking out the latest Atlas, and comparing it to the Maps of a Decade or Two back. So much has changed in such a short time. This Floor Puzzle is a great way to help your Baby learn the Geography of the United States. Each state is a puzzle-piece! My dad loves the kind of jigsaw puzzle that has 1000 pieces. Puzzles challenge all of us to exercise our Brains, Hands, and Eyes. They are much better than Video Games, in my humble view. Gift your Kids and yourself a couple of Puzzles this Christmas, and I am sure you will enjoy the experience of assembling together the pieces. The Puzzles listed below will help your creative juices flow during the Holiday Season and beyond. This bright and colorful Nativity Puzzle is a cool gift idea for not just Christmas, but Advent, and other religious festivals and celebrations too. Jesus is knocking on your door. Are you ready to welcome him - into your heart, and your home? There are lots of cool Jigsaw Puzzles with a Christian theme - which will help you not only have loads of clean family fun, during Christmas, but also get closer to the real meaning behind this festival. Get some of these beautiful Puzzles for your kids, and gift them too. Spread the Good News far and wide this Christmas, and beyond. Most of us want to see a miracle, in order to be convinced about an individual's divine connection. However, human nature is frail and history has shown us that people forget the miracles and begin to question again, soon. Jesus performed many Miracles while he was on Earth. This puzzle is a great way to remember the life of Jesus, and rededicate ourselves to the path shown by him. It would be hard to find a kid who doesn't admire a Superhero. In fact, us adults too would love to have the powers these imaginative friends possess. There are lots of gift items related to Superheroes, which you can consider presenting to your kid on the Christmas eve. Superhero Puzzles are just one possible choice. Superhero's are very popular with boys. These Puzzles are fun, affordable, and offer skill development, and team play opportunities. Let's check out some of the Coolest Superhero Puzzles on offer for Christmas. Shown here is a 150-piece puzzle featuring all kinds of superheros. As the amount of pieces ought to make clear, this is not a puzzle for your average 3-year old, whatever the description may say. I would not give it to most 5-year olds either, in fact. An 8-year old who is into superhero's seems like the proper recipient. A cool treat for all young fans of the mighty Transformers. Put together this thirty six piece glow in the dark puzzle, and hang it in your room as a Poster! Modern art jigsaw puzzles often offer an extra challenge in piecing them together because the lines and forms are painted in such a way that may not seem logical until the pieces are all interlocked together. See also my new gifts blog.